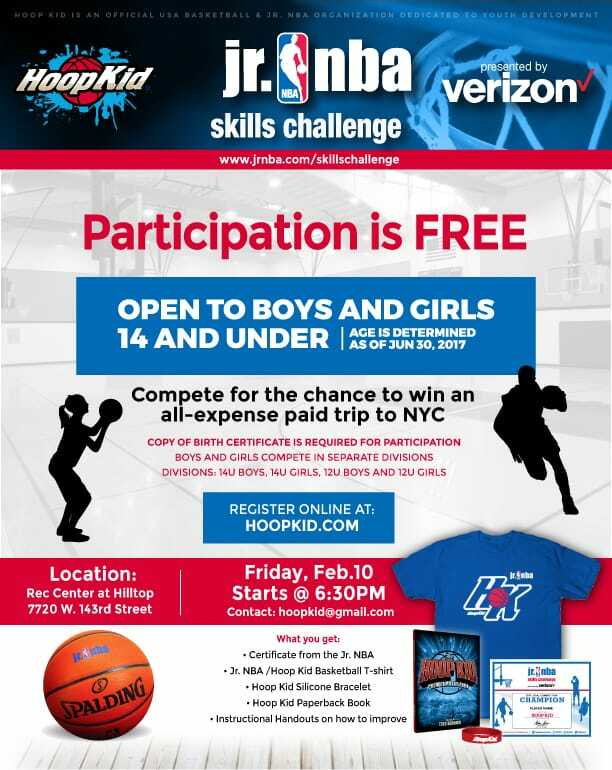 The Jr. NBA Skills Challenge presented by Verizon provides boys and girls, ages 14 and younger, the opportunity to showcase their fitness through a dribbling, shooting, and rebounding skills competition in the sport of basketball. The program is free for all participants and organizations. Boys and girls compete separately in two different age groups: 12U and 14U. The Jr. NBA will host a Regional Competition at eleven pre-determined multi-court facilities on a Saturday or Sunday. Players receive t-shirts, awards, and potentially team/sponsor related items. The top 5 Champions out of the 11 Regional Champions in each age and gender group will advance to the National Finals. Regional Competition Markets: Colorado; California (2 locations); Florida; Indiana; Illinois; New York; Oregon; South Dakota; Texas; Washington, D.C. The top 20 Regional Competition Champions will compete in the National Finals Skills Challenge. Finalists win an all-expense paid trip to New York City, receive gift bags, attend special events, interact with NBA/WNBA/D-League Players, Legends, & Draftees, and attend the 2017 NBA Draft presented by State Farm.